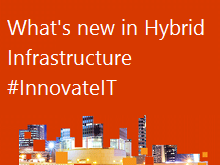 Deliver a true hybrid IT infrastructure without sacrificing security, control, or reliability. Take advantage of the powerful capabilities in Windows Server 2016 and Microsoft Azure and get the knowledge needed to transform low-cost, x86 standard hardware into a powerful software-defined fabric, engineered to deliver the best platform for applications and workloads. Attend this free one-day training event to learn how to evolve your datacenter into a true hybrid cloud model to achieve greater efficiency, flexibility and scalability. Confidently virtualize your mission critical workloads on-premises with Hyper-V, and in the cloud with Microsoft Azure. Implement new software-defined storage and network architectures to increase storage performance, flexibility and redundancy. Get the smallest footprint, reduced patching, most cloud-optimized OS performance available, with Nano Server. Extend datacenter resources by using virtual networking to bridge the gap between your on-premises infrastructure and Microsoft Azure. Enable single-click deployment of complex, multitier apps across VMs, storage, and networking with the new Azure Resource Manager. This event is part of the Microsoft IT Innovation Series, which also includes events focusing on Hybrid IT Management and Services, Windows 10 Enterprise, and Microsoft Enterprise Mobility solutions. 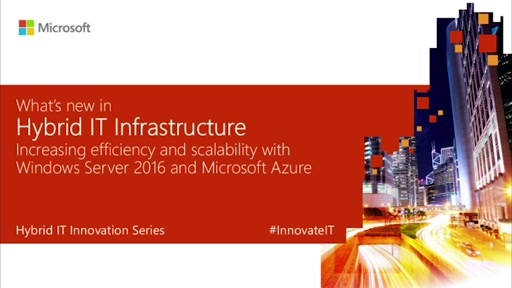 For more information, visit the Microsoft IT Innovation Series page.